14, 2018: The U.S. District Court in the Northern District of Texas declared that the individual mandate of the Affordable Care Act (ACA) is unconstitutional and that the rest of the ACA is unconstitutional, as well. Although this was an interesting order by the Court, at this point in time, the status does not impact employers’ group health plans. More to come on this! January 2019: Social Security recipients will receive a 2.8% cost of living (COLA) increase in their monthly benefits, starting this month. A Happy, Healthy New Year to All! January is National Blood Donor Month. Blood donation falls in the winter months, sometimes creating blood shortages when they are most needed. Did you know that three lives can be saved per pint of blood donated? Unfortunately, fewer than 10% of people eligible to give blood, do it. If you or a friend or loved one has ever needed blood, you know how important giving this gift of life is! If your company doesn’t currently host a Red Cross blood drive at your site, please consider contacting your local Red Cross office (redcrossblood.org) about hosting one, or at least encouraging your employees to donate outside of work as part of your community support efforts. New research at Johns Hopkins University found that over a period of 10 years, individuals with untreated hearing loss had a 52 percent greater risk of dementia, a 41 percent higher risk of depression and an almost 30 percent greater risk of falls than those with no hearing loss. Group health plans typically do not cover the cost of hearing aids, which is unfortunate since they are outrageously expensive. However, health plans frequently do offer the ability to take advantage of discounts with some of the larger hearing aid companies, like Miracle Ear. Especially if you have an older workforce, you might want to help your employees by publicizing these discounts if they are available. As a start, encourage your employees to have a hearing test. You are 30 percent more likely to get in a car accident on only six hours of sleep than after seven to nine hours. And, getting only four hours of sleep triples your odds of an accident! Eating 1 ounce of nuts five days a week can reduce heart disease risk 20 percent. Fifty percent of airport security screening trays are contaminated with viruses such as the flu. To reduce the possibility of getting sick while flying, wash your hands or use a hand sanitizer after going through security. 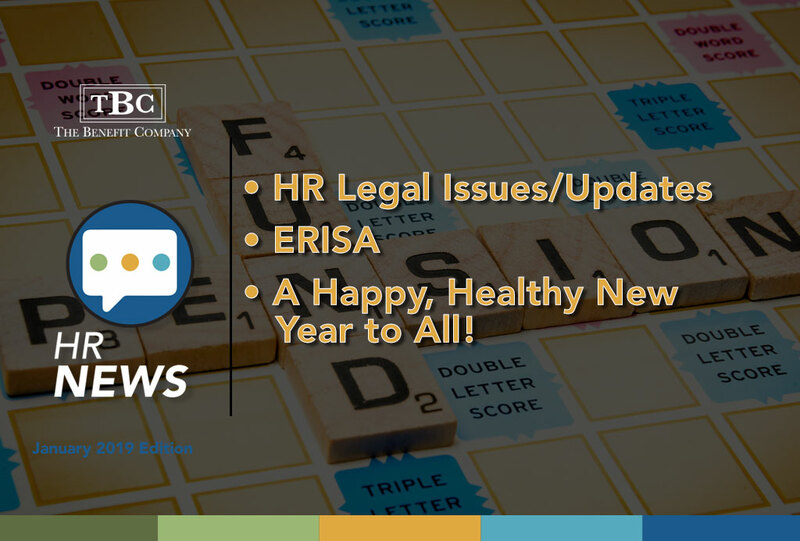 If employee benefits are not an everyday part of your HR job, you may not be familiar with ERISA. However, its broad reach and potentially hefty penalties for non-compliance put it on the list of HR topics worth learning more about. Here are some key points about ERISA. ERISA is a federal law that was enacted to protect private sector employees who participate in certain pension and health plans. It operates under the U.S. Department of Labor. Like most other federal programs, administration of ERISA has resulted in numerous and complex regulations for employers to follow. And, the original law has expanded over the years, and now includes amendments like COBRA, HIPAA, Newborns’ and Mothers’ Health Protection Act, Mental Health Parity and Addiction Equity Act, and Women’s Health and Cancer Rights Act. Failure for employers to comply with ERISA can lead to significant penalties, including paying fines for each day of non-compliance or fines paid per each employee depending on the infraction. Although ERISA does not require employers to establish retirement or pension plans for their employees or dictate how much participants must be paid, once those plans are established, the plan generally must comply with ERISA standards. Examples of the type of responsibilities employers have under ERISA include informing participants of important details of their retirement and pension plans, such as when they become eligible to participate in the plan, how they accumulate benefits and become fully vested, and that plan sponsors must adequately fund their plans. Two general types of retirement and pension plans fall under ERISA: Defined Benefit Plans (those fully funded by the employer and that offer retirees a specific monthly payment), and Defined Contribution Plans (that employees and employers contribute to, such as 401(k) plans, that do not promise a specific benefit amount). Although ERISA originally only applied to retirement and pension plans, other health and welfare benefit plans have come under the umbrella, and may include paid time off benefits such as vacation and holidays, and employer-sponsored insurance plans including long-term and short-term disability insurance and life and health insurance. The ERISA rules are complicated! If you are a private sector employer and are not sure how ERISA applies to you, be sure to touch base with an experienced ERISA attorney.